Powerful 9.6 amp motor with electronic speed stabilization– gets the job done faster! 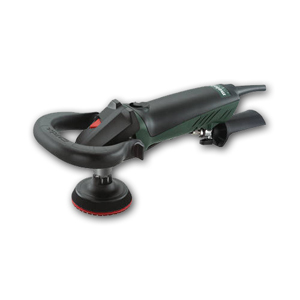 Variable speed versatility– choose from fast stock removal to final polishing, and everywhere in between! Metabo Long Life motor with epoxy coated windings, thermal overload protection and winding protection grid– maximizes service life! 3-year Metabo warranty (with registration), the longest warranty in industry! You will need 1/2" quick connector with hose to connect this machine with faucet. For more detailed information, please refer to this Metabo Wet Polisher brochure.